Fishing Industry is one of the oldest as well as largest markets in the world. This industry involves various activities on a daily basis. They are- fish harvesting, catching the fish, processing it, transporting and distributing it to the broad market. It also includes numerous other activities such as the fishing vessels constructions, refrigeration, fishing gears, cold storage equipment, and others. This sector is estimated to have an approximate 54.8 million people who are engaged in the fish production process. As mentioned above, this industry has an enormous size, where it contributes to the livelihood of 10 to 12% of the world’s population. Hence if you have ever thought to tap into this sector, you are in the right place. Blue Mail Media helps you in this business with the help of the Fishing Industry Email List. That is, with the help of this email list, you can reach potential prospects as well as top-notch decision makers in this area. If you are planning to enter into this sector, we are here to help you. 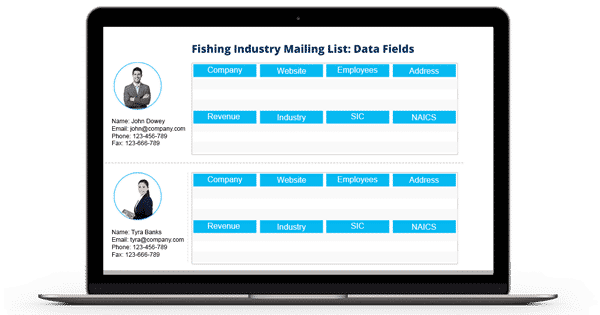 Blue Mail Media’s Fishing Industry Executives List offers you the high-performance data that lets you reach all the top-notch decision makers of this sector. This list is made available in both pre-packaged and customized format for your benefit. Blue Mail Media, the best data solution provider, offers the best Fishing Industry Executives Email List for you. It comes with more than 85-90% of accuracy and deliverability rate and also designed to stay compliant with the GDPR and Anti-Spam law. Hence you can make use of the data provided in our reliable database without any fear. We have a team of data scientists and experts who collect all the required B2B contact records from authentic as well as internationally trusted sources using high-end technologies. The sources include yellow pages, trade shows, business directories, surveys, government records, conferences, and more. This team also perform the quality checks on a regular basis; they make thousands of verification calls as well as send several emails regularly. That is, they are responsible for keeping Fishing Industry Email Database free from errors and redundancy. Our list provides all the essential information for you to do the business in this area. It includes first name, last name, phone number, mailing address, SIC code, NAICS code, and many more. Also, with our list, you can reach prospects residing in various parts of the globe with no much effort. Hence if you wish to maximize your revenue as well as conversion rate to a greater extent at a less time, buy our Fishing Industry Executives List now.